I was looking at some decorating sites the other day and saw a lamp shade where they put a decal on the inside. I thought it was a pretty cool and easy idea. 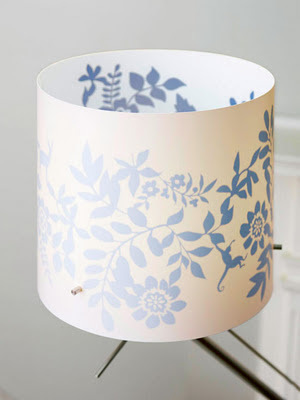 Of course this led to me looking around for other creative lamp shades... including a few in my own home. 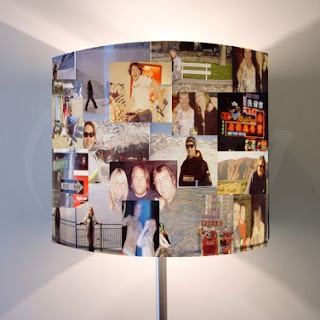 The next two shades could be made with some Mod Podge and your own photos, magazine clippings, fabric, scrapbook paper, or how about sewing patterns. Or you can buy a kit for under $20 at Glow (includes the shade). The next two don't look as easy to make, but I thought the were pretty clever. 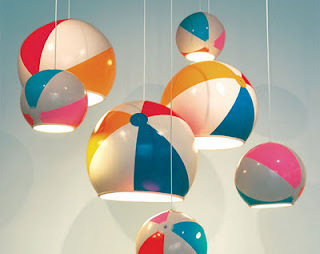 The first one is made from old beach balls. I love this next one. 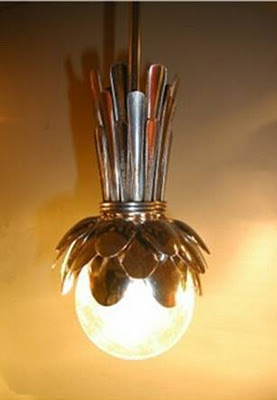 It's made of old spoons! Pretty fun for a kitchen or even outside. And depending on the type of sliverware used, it could develop a nice looking patina. The next two are from my house. 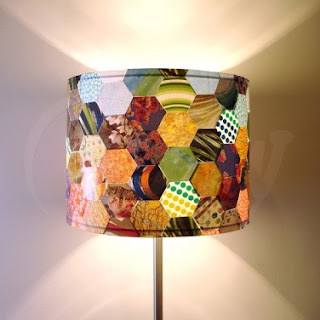 The first one was made with some old earrings I had left over from my craft show days and a lampshade from Ikea. I just left the earring wire on them and poked them through the shade. Something like this with Christmas ornaments would be really cute! I also put some earrings with post backs on some fabric sconces I had. I don't have a picture because they are packed up until I have a place to put them (in my 'under construction' house). The earrings I used on the sconces were made by gluding beads and buttons onto cardstock. The shade on the bottom is one of two that we have in our bedroom. With no room for night stands, I wanted lamps that could be clipped onto the narrow shelf I have as a headboard. I found these at Pier One a few years ago. But the shades were too plain. So I painted dots on them and glued black pom poms around the top and bottom. I really like some of the shades I've been seeing where they remove the shade and leave the wire frame or decorate the wire frame. As soon as I find a place for something like that in my house, I'm going to make one. Isn't this one from The Letter 4 gorgeous?! I really like these too. 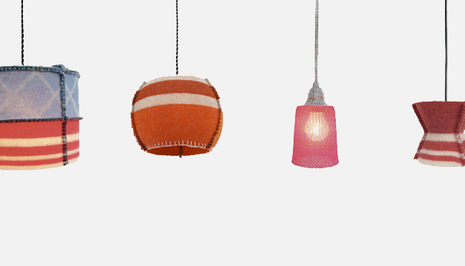 Sort of like a sweater for your lamp. Looks cozy! Wow! I like SEVERAL of these! The spoon and family picture ideas are really unique. Clever use of the earrings by the way! 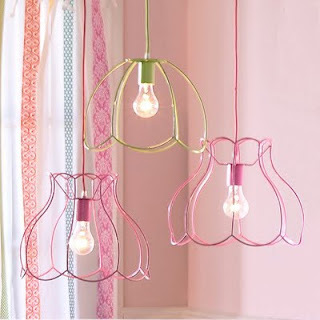 I might have to try your idea with Christmas bulbs--cute! Thanks for all the inspiration!